I was recently tasked with piloting a couple of design tools designed to help us with our development. The first one was FitNesse, and the second Cucumber with Groovy. The problem with “cutting edge” pieces of software tooling is that the tutorials are often up to the mercy of those who pioneered it. This is not always a good thing. In fact unless they are communicative experts its a bad thing; its a bad thing because the guys who come up with this magnificent software aren’t always the same as the guys who are able to write the best tutorials, and explain the simplest concepts (or see the need to). Great software requires collaboration and communication. 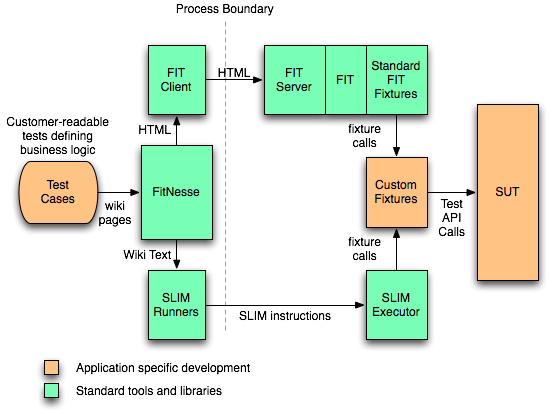 FitNesse is a tool for enhancing collaboration in software development. FitNesse enables customers, testers, and programmers to learn what their software should do, and to automatically compare that to what it actually does do. It compares customers’ expectations to actual results. Well righto! thats right and its also correct, so what is it? Developers willing to code adaptor classes that populate your business objects/services using setters and getters. BA’s willing to use the wiki, and learn its own little language syntax. Overall it was quite straightforwards to setup, I found the options were not amazingly intuitive but after a while I got the hang of it, and its nice to see the green filling in the boxes to show your adaptor (fixture) class is discovered and tests passed. What is Cucumber and Groovy? Ah looks good except for the Ruby bit because I have Groovy, and that took long enough to get working. Good news comes in the form of cuke4duke which gets Cucumber to work with Groovy. Fortunately the guy who did it had some examples underneath the tutorial (Aslak Hellesoy) and I was eventually able to piece together some command line prompt uses from elsewhere on the net. So what is Cucumber and Groovy in my words? Cucumber involves a form of structured english language in the form of a scenario or set of scenarios. Groovy then receives these instructions and using regex sneakily uses the JVM (without compilation need) to test the assertions. I found it a little trickier and slightly frustrating to setup in terms of command line stuff, but I eventually got there, configuration is the bane of me so this is where I am most likely to get frustrated and give up, but after I got there it seemed to behave itself! I actually like them both, but I would say that Cucumber may edge it, for the domain language used will help slightly more in delivering business value, but I would expect both of these to evolve over the coming months and couple of years to something where both are better than either of them now. The only thing that put me off about the domain language of FitNesse was the use of “Fixtures”, quite obvious when you know but not when you don’t, remember its about selling this to those who are new to the product. If they had said the slightly more wordy “Custom Static Adaptor” then as a Java guy I’d know about it, and as it in my case is written in Java then thats the right domain terminology. They could have written “Custom Glue Code”, and I’d have had a better idea too, the name itself made me think that its another domain specific language with nuances I need to learn. These are great great tools, made by extremely intelligent people (far more than myself) but often they dont have the time to sell it / package it / sugar coat it into something that will be found easy by all those invovled in using it, and by that I am talking business and BA’s. Its one thing creating an expert tool/concept/idea, but if you can explain with examples in a really simple manner then it makes the job easier for people who come across the tool (who may not have fantastic communication/selling skills) who want to adopt agile and are also trying to sell to their bosses so they can get top down buy in. In balance now I know them a little more I’d be comfortable with using them both, in fact I would try them both rather than reccomend one of them, each project team has a slightly different domain, and remember we are into writing really good software, whatever tool works best we use. If the company is “wiki-mad” and the requirements are less wordy and more calculative and the Java developers very enthusiastic then there is no reason FitNesse wont work well. If you already use Groovy it may be a mistake to go towards FitNesse, but still try both and see! Experiment! This entry was posted in Agile Requirements, BDD, Cucumber, FitNesse, Groovy. Bookmark the permalink. I think you are missing the concept completely, and by that I mean you are missing the concept completely. FitNesse is for acceptance and integration testing. JUnit is for unit testing. They are completely unrelated. You need both. A Unit test tests manipulation within a single method. An integration test tests interactions among different objects. An acceptance test verifies that the acceptance criteria agreed to in the confirmation part of the story has been fulfilled. Acceptance criteria are written by business and tester folks, so the mechanism has to be one they are comfortable with. FitNesse allows them to use Excel, their favorite tool. The developer starts with a set of failing acceptance tests and writes unit tests as he implements the functionality. Unit tests are then run with the build and break the build if they fail. Acceptance tests are run in another leg of the pipeline and they stop promotion if they fail. Hi, firstly thanks for taking the time to comment. The “concept” I was trying to explore (now some time ago) was the difference between FitNesse and Cucumber (at that time), not really JUnit so much. I agree with most , in fact virtually all of your statements too, except for the first couple. I understand you are trying to make a distinction between the usage JUnit and FitNesse which is a different concept, and as I alluded that my preference was to use JUnit, why? Let me explain, with some context. Picture now a small company, working in a very small team now, one which may not be a corporate type. You may not have time or budget to set up a large acceptance testing system. So you have your unit tests. 1) can you use JUnit to write acceptance tests? Sure you can. They might be harder to read for your generic corporate BA, but if you are sitting with a business owner… it can work. 2) Do they belong with the unit tests? Absolutely not. Stick them under a different structure, maybe packaged as acceptance tests. 3) Are they structured the same? Nope. 4) Do they leverage your unit tests? Absolutely. 5) Are they readable by the business? Well if your business owner can read camel case and you can write readable Java, then yes. Now, in your situation with BAs wanting to spoon oodlesful of excell exported data into fitness, I suggest your describing a different problem domain to mine. You might argue that JUnit doesn’t scale, and that could be right, but that depends on the number of acceptance tests you are likely to need and again the context.